Perhaps you missed this release last month, but fortunately we got the opportunity to review this one, although it's a little late. The Norwegian band got an allowance for this debut of 20000 NOK, which is about 2200 Euro. Not a big amount, but at least you can buy some studio time. The whole band also plays as live band for the band Ihsahn. The vocalist Einar Solberg, you probably know from the Emporer live reunion back in 2006/2007, he did some backing vocals and synths. 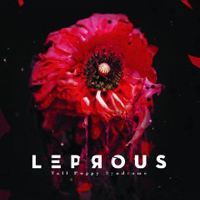 Leprous is a progressive metal band which combines clean singing with more aggressive vocals. The clean singing is o.k., but not very impressive and the aggressive parts could have sounded a bit more convincing. Nonetheless, the music is another story; the band takes you on a path of experimental and technical metal with strange rhythms and a lot of variety. Some songs like "Phantom Rain" have nice piano parts while other songs include more 70's Hammond kind of synths. Every now and then they use jazzy-elements in the songs as can be expected from a progressive band, some songs are very long, over 11 minutes. In my opinion the title-track is one of the best songs on the album. Expect a jumble of styles and if you can dig elements of Opeth and bands like The Mars Volta this should be a good record for you. I advice you to listen to it more than once to discover the beauty of the album. Not bad for a debut and if the vocals improve on the next one, I expect a real hammer.